Thanksgiving is right around the corner and this year I'll be rocking my Thankful tee. My son is so excited for Christmas, it seems he's ready to skip Thanksgiving altogether. Well, except for the food part. Me on the other hand, well I just want to take it one day at a time. The season of Thanksgiving reminds us that there's always something to be thankful for and I want to practice being thankful. I have been wanting a thankful t-shirt for a long time now. Last year, a company was selling these like hotcakes and they sold out before I could get my hands on one. This year I knew I wanted one and started looking early. I found one from Torrid that fits me like a glove. Plus, the burgundy wine color is a trending for fall fashion. But you can also find a huge assortment of Thankful t-shirts on Amazon here. 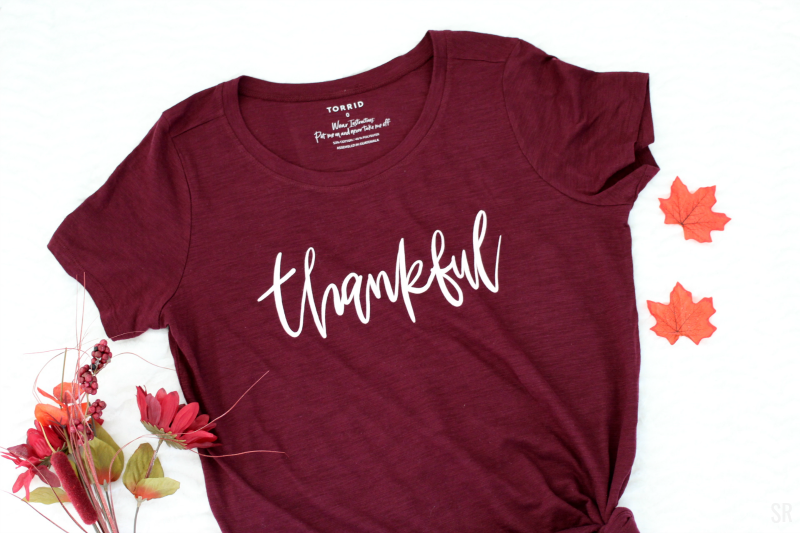 This thankful graphic tee would make an easy thanksgiving outfit that can be worn whether you are hosting Thanksgiving in your home or visiting family. I would style this with a plaid shirt, jean jacket, or cardigan and ankle boots. This women's Grateful sweatshirt comes in plus sizes too can be found at Target. Oh, and don't forget about the kiddos. there are Thankful t-shirts for kids too. Happy Thanksgiving to you and your family! What do you like to wear on Thanksgiving?